Join us and don’t miss the European DXN event of the year 2016! We invite you to the IV. 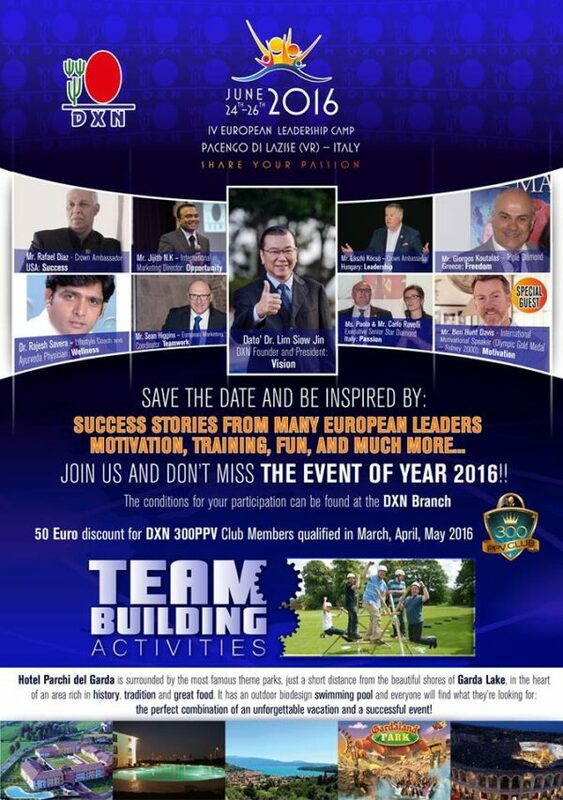 European DXN Leadership Camp Lake Garda to be inspired by success stories from many European leaders, motivation, training, fun, and much more. The IV. European DXN Leadership Camp Lake Garda will be held on 24th of June to 26th of June 2016 at Hotel Parchi Del Garda – Pacengo Di Lazise, Verona. Learn from the most successful DXN Diamonds and DXN leaders in order to become better and more succesful! They help you to dream more, learnd more, do more and become more! Registration fee (exluding transport) is 350 Euro inc. VAT. For those who become DXN 300 PPV Club members from January to May 2016, will be eligible for 50 Euro discount on the participation fee for the camp. Price for DXN 300 PPV Club members will be 300 Euros including VAT. The conditions for your participation can be found at your neareast DXN Office or DXN Branch.